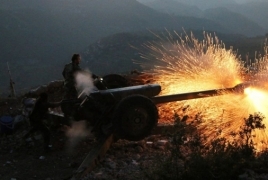 PanARMENIAN.Net - The Syrian Arab Army (SAA) carried out a new military operation on Tuesday, April 16, in the eastern part of the Deir ez-Zor Governorate, Al-Masdar News. According to a source in Deir ez-Zor, the Syrian Arab Army began the operation near the key border city of Albukamal, which was liberated from the Islamic State (ISIS/ISIL/IS/Daesh) in late 2017. The source said the Syrian Army is attempting to clear the Islamic State’s hideouts near the Iraqi border; this comes just 48 hours after the terrorist group carried out another ambush along the Palmyra-Deir ez-Zor.